BOSTON, May 15 — The father, a longtime military man, from West Point to Vietnam to the first Persian Gulf war, became an early public critic of the war in Iraq, writing frequently and potently about its causes and effects. 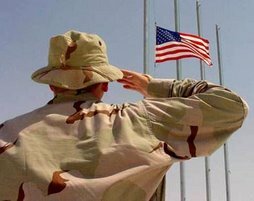 But when his only son joined the Army and was sent to fight in that war, the father, Andrew J. Bacevich, a professor of history and international relations at Boston University, expressed only support, said a family member and colleagues. On Sunday, two soldiers came to Professor Bacevich’s home in Walpole, Mass., with the kind of news that a military man knows is always possible: First Lt. Andrew J. Bacevich, 27, the son, had been killed by a bomb while on patrol in Balad, Iraq. Michael T. Corgan, an associate professor in Boston University’s department of international relations, who also has a military background, said Professor Bacevich knew the risks his son was taking. Professor Bacevich declined to be interviewed on Tuesday, but his views on Iraq are well known, and they appeared to be given a certain weight in public discourse, in part because of his background as a retired Army lieutenant colonel, an observant Roman Catholic and a self-described political conservative. Colleagues said such opinions came from deliberative research. “He was not a sort of ideological, hard-line critic,” said William R. Keylor, a professor of international relations and history. Professor Bacevich did not, however, speak out vociferously to his son, Jennifer Bacevich said. “My father, although he makes no secret of what his opinions are, believes that when his children become adults they can make decisions for themselves,” she said. The younger Andrew Bacevich, like his siblings, was steeped in military life. He was born at West Point, his sister said, and spent his first 13 years moving with the family to military postings in Kansas, Virginia, Texas and Germany. “The army, it takes over everything: where you’re going to live, go to school, who your friends are,” said Ms. Bacevich, who is 34. As a student at Boston University majoring in communications, her brother joined the Reserve Officers Training Corps but was taken out because he had asthma, Ms. Bacevich said. After college, the gregarious young man, who ran marathons, worked in politics, as an aide to State Senator Jo Ann Sprague and later to Gov. Mitt Romney, but when he learned that asthmatics were being allowed to enlist, he signed up, his sister said. Professor Corgan said, “I think young Bacevich joined because of what he saw in his father. In October, the younger Mr. Bacevich was deployed to Iraq with the Third Brigade Combat Team, and was scheduled to return home next January. The politics of the war never came up, she said, adding, “My brother was very aware of military duty being a duty, so it was not something that he would feel” was appropriate for him to focus on. His father, with whom he frequently exchanged e-mail, kept his views separate from his feelings about his son. Professor Bacevich insisted that journalists quoting him about the war not mention that his son was serving in it. And when colleagues asked how his son was doing, “he always indicated fine, no problem,” Professor Keylor said. Andrew J. Bacevich is Professor of History and International Relations at Boston University. 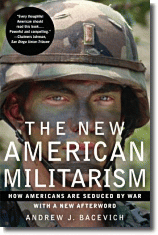 His most recent book is The New American Militarism: How Americans Are Seduced by War. His son also named Andrew J. Bacevich was killed in Iraq on Mother's Day! 1st Lt. Andrew J. Bacevich, 27, of Walpole, Mass., died Sunday, May 13 (Mothers' Day) in Balad, Iraq, of wounds suffered when an improvised explosive device detonated near his unit during combat patrol operations in Salah Ad Din Province, Iraq.He was assigned to the 3rd Battalion, 8th Cavalry Regiment, 3rd Brigade Combat Team, 1st Cavalry Division, Fort Hood, Texas. BACEVICH, Andrew J., 27, First Lt., Army; Walpole, Mass. ; First Cavalry Division. FARRAR, William A. Jr., 20, Pfc., Army; Redlands, Calif.; 127th Military Police Company, 709th Military Police Battalion, 18th Military Police Brigade. FRANK, Michael K., 36, Specialist, Army; Great Falls, Mont. ; 82nd Airborne Division. SAUSTO, Anthony J., 22, Pvt., Army; Lake Havasu City, Ariz.; Second Infantry Division. ZEMBIEC, Douglas A., 34, Major, Marines; Albuquerque; Headquarters Battalion, Marine Corps National Capital Region.